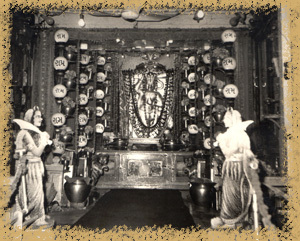 Shri Camp Hanumanji Tample Miracles. The above historical event was described in detail in a book Shri Camp Hanumanji by Vandanaben Shukal , Shastrinagar, Ahmedabad, Vikram Sanvat 2039, year 1983. Akhatrij. The first woman prime minister, on being victor in election came for viewing by her free in Shri Camp Hanumanji Temple together with Shri Madhavsinhji Solanki and Ghanshyam Pandit on 9th March 1980, Sunday. Vad- 6 in Sandesh and Gujarat Samachar. Today and astonishing and magical event happened in the historical Camp’s Hanumanji Temple of Ahmedabad. Today around at 10-30 to 11-00, after completion of Aarti ceremony of Hanumanji, priest Shankarprasad, Badriprasad and Bhagvatprasad came out. Within a few moment Hanuman’s statue changed its new colour, with a slight sound and ancient shield of gold and silver thin layer and Hanuman’s vivid statue was appeared as if it was laid newly today. Having changed his shield by Hanumanji, approximate six to seven Man (140 kgs) layer of gold-silver were broken down. And there was a vivid and divine viewing of Hanumanji. It is said that lord Ramchandraji bestowed a ring to Hanumanji for searching Sitaji. Taking which, Hanumanji went to Ashokvatika in search of Sitaji. At that time Hanumanji rested at this place and this is a statue for that event. On being removed the old shield on the statue, a golden ring in hand of Hanumanji is clearly shown. Therefore, today corroboration is received is received to that ancient myth. In Shastra, it is said that “Shraddhavan Labhyate Gyanan”., Success is definitely achieved by faith and diligence, trust and devotion. This thing is given in all religion. It is the best to die, observing his religion. Great man, Gods of each religion are doing miracles, therefore they are called great, became symbol of worship and faith. Hereunder we refer the miracles of Shri Camp Hanumaji. In the ruling of English, one English officer experienced miracle of Hanumanji. He used to punish the devotee of temple and priest in the vein of power. Then a miracle happened and he himself becomes distressed by his physical and mental pain. On deeply thinking he occurred that on being obstructive to the temple of God and its devotee, he has become distressed. One day at 5 am in the morning he arrived and sits before opening the doors of temple. He begged pardon before the God and priest and stopped to misuse of his power against the temple. This is a true event. Its recital is in the book. Despite of not being Hindu, he became devotee. Such one other occasion occurred to the one English officer. Some Hindu servant suggested English Husband wife for a religions vow for issue. On birth of the son due to bless of God he cane with band at Camp’s Hanumanji Temple. On giving inspiration by priest Shri Badriprasadji, he ordered o play police band each Saturday, whose observation is continue till today. Today which such event be collected by a writer, thousands of such devotee can give evidences of miracle for examination, marriage, lottery, victory in court case and victory in election and other many work achievement. Even today cloth minister Shri Kashiramji Rana and home minister Shri Harinbhai Pathak comes on Saturday for viewing. The third miracle happened on 2nd June 1953, Monday at 10-00 pm at night. 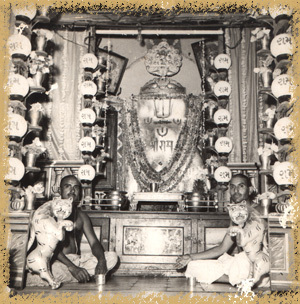 Late priest Shri Badriprasadji Gajanandji used to worship in morning and evening at that time. Morning at 4 O’ clock, at 12 O’ clock and in evening at 4 O’ clock he used to do Trikal Sandhya. 1953, on second June, Tuesday at 10-00 O’ clock the shield of statue broken down with blow. All rushed and looking this scene became surprised and pleased. First of all in statue only two eyes were seen, no one was knowing about the form of today’s statue. In the statue which disclosed, Hanumanji was looking in a form, at the time he went to Lanka to meet Vibhishan in a guise of Brahmin having a man type of face. Pitambar and Khesholder, Crown on head, tail behind Pitambar, scene as if he blessed by his right hand, ring (Mudrika) held in his right hand and glowing diamond therein. Looking such a scene, million of people rushed enthusiasticlally. Perheps such and event will be first time in India. On every Sud 14, Oil , Sindur and layer is offered to Shri Hanumanji. At that time beautiful viewing happens of the entire statue (and also at the time of worship in morning and evening). Everyday morning and evening he is adorned by flowers. On the shield being changed, today 50 years are completed in the year 2003, 2nd June, Monday. The completion of 50 years of the shield being changed has been celebrated by religious occasion with heavy grandeur. From the camp Hanumanji Temple Trust, Golden Jubilee auspicious occasion was celebrated by Mahant Shri Gordhanprasadji Sharma, President Shri Parthivbhai Adhyaru and Shri Arunbhai Shah, as described below. On 1st June 2003, Shri Hanumanji Rathyatra Started at 8-00 am morning and reached Paldi, Narayannagar, Temple of God of Wind (Vayu). At night 8 to 11 am, reception of Saints, lecture and released of book and also Bhajan of Bhajan King Niranjan Pandya. Thosands of devotee participated therein. 2nd June Monday was a day for disclosure of Satue. Mangla Aarti held at 5-30 am in the morning, 56 Bhog (Offerings) were presented. Sundarkand Path were done by Shri Nandkishor Shastriji and Hanumantyag Yagya was held at 10-00 am to 4-00 pm. Vice President Shri Bhairavsinhji Shekavat arrived for viewing at Shri Camp Hanumanji Temple 12-15 pm on 27th May 2003 Tuesday for Viewing. Inspirational events in a life of Shri Gajanandji Jagannathji Pandit, Initial priest of Priest Family. 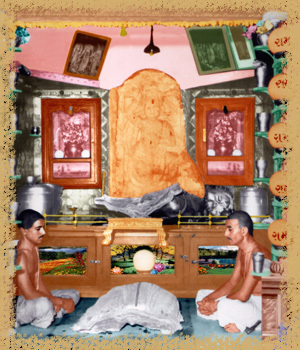 Shri Gajanandji was a concentrated devotee of Shri Hanumaji. He lived in Camp Sadar Bazar. One day while he was coming from Bhadrakali at night on Tuesday. It was way to come via Temple. Near a temple a muscular bodied Sadhu Maharaj Called him. In that time, out of every temple there were Akhada of Sadhus. Gajanandji asked: Maharaj, what is your order? How can I server you? In the guise of Sadhu, Shri Hanumanji said “whatever edible thing you have, do put it”. Gajanandji put a bundle of flour and filled water with a rope and smail pot. Maharajshri ate raw flour and drunk water and talked with Gajanandji, gave instructions and called for water again, disappeared. Hon. 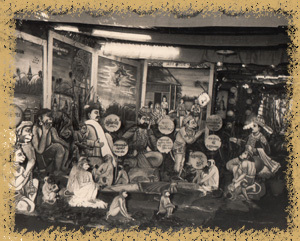 Gajajanandji came that place, Maharajshri searched him all the way, but Sadhu Maharaj did not find. Picking his bundle, he saw a golden shoes, took away home and shown it to her wife and daughter, understood that Shri Hanumanji arrived. Next day put the shoes near the statue of the God in Camp Hanumanji Temple. Next day shoes vanished. One day Shri Gajanandji send for Sadhus from all the twelve gates of Ahmedabad convening a Bhandara (Feast in Group). Made arrangement of dining for Sadhus. It was Ashadh month, there was circumference of clouds. Out of kitchen, Mahant of Jagnnath Temple was sitting. He said Gajajnand if the clouds would shower, this cooking will be adulterated. Sadhus can not sit in mud and will go without dining. Pray the son of wind, Shri Camp Hanumanji, the clouds will be removed. Shri Gajanandji prayed with full of tears before Hanuman Dada that “please send the God of Wind (Vayu) and remove these clouds otherwise the devotee will go back hungry.” Shri Hanuman Dada listended his prayer and a miracle happened. God of Wind (Vayu) arrived, cyclone cam and pulled clouds. Sadhus dinned with affection and thereafter it heavily rained in the evening. All Rights Reserved, Shree Camp Hanumanji Mandir, Ahmedabad, Gujarat, India.